The illustrated Lansky Knife Sharpener is the Lansky Diamond and Ceramic Four Rod Turnbox Knife Sharpener that features two 5" diamond rods for aggressive sharpening, and two 5" ceramic rods for edge finishing. A wood base with two preset angles and rod storage is included with this Lansky Knife Sharpener. Use the 20 degree fine angle for sharpening slicers, fillet knives, butcher knives, paring and skinning knives. Use the 25 degree medium angle for sharpening hunting knives, camping knives, utility and chef's knives. 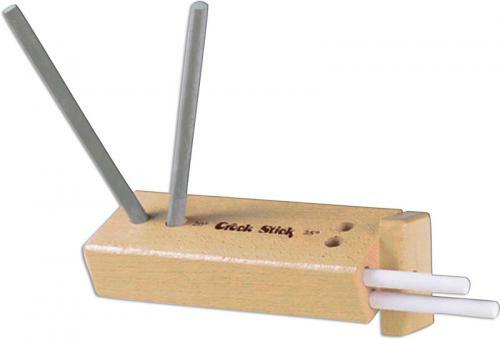 The Lansky Diamond and Ceramic Four Rod Turnbox Knife Sharpener is assembled in the USA.